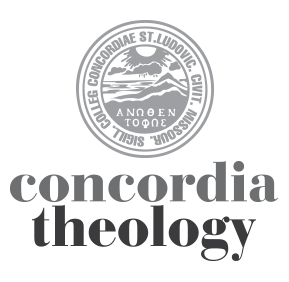 Editor’s note: This past fall, Professor Jim Voelz presented the following remarks at a convocation at Concordia Theological Seminary, Fort Wayne, Indiana. If they sound familiar, they also happen to be the same remarks with which he begins each Elementary Greek class he teaches. Teaching elementary Greek is dependent upon a larger question: “Why should one learn Greek (or Hebrew) at all?” Why should you learn one of the original languages in which the Word of God is originally written? In fact, that is not a question that is all that straightforward to answer. On the one hand, it is not right to say: “If you don’t know Greek, you really cannot understand the New Testament at all.” That is not true. Many strong believers and many strong witnesses to the Gospel have had no knowledge of Greek. (St. Augustine may well have been one; certainly my mother was.) On the other hand, it is not right to say: “It really doesn’t make any difference at all, if you don’t know the original; it’s just a seminary hoop to jump through.” That, too, is not true. Here is my answer by way of analogy. The difference between reading the NT in English, on the one hand, and knowing Greek and interpreting the NT with it, on the other, is like the difference between watching an NFL game on a 12” black-and-white TV and being at the game. The two experiences are not entirely different. It’s not as if, when you watch on the small TV that the Indianapolis Colts win, but if you are at the game the Green Bay Packers win. But—when you are at the game you see so much more and you have a much deeper understanding of what is going on. This was driven home to me in 1995, when the Rams moved to St. Louis from L.A., and my colleague Chuck Arand and I got season tickets for the games. Only when you are at the game do you understand the terror of playing press cornerback in the NFL—you’re out on an island against a lightning fast, jitterbug wide receiver, backpedaling, flipping your hips, and then, it’s apparent, just how much ground you have to make up to close and deflect the pass. Only when you are at the game is it apparent what a fantastically accurate cannon of an arm Dan Marino had. Indeed, only at the game can you just feel momentum shift in the building, as when Jim Kelley just “willed” the Buffalo Bills to a win in the last two minutes of a game in which he had done almost nothing for the previous 58. With word order, which is more flexible in Greek as an inflected language than it is in English, which is largely non-inflected, you can see points of emphasis that are not normally conveyed in English translations. With the middle voice and verbal aspect features, dimensions of meaning not easily communicated in English without often awkward extra verbiage become readily apparent. This, then, is the baseline and the foundation for the classroom experience of elementary Greek. Yes, such a class is a kind of “hoop” for students to jump through in order to commence your seminary training. Yes, it is an academic class. But mostly the experience of elementary Greek is a chance to be electrified by the depth of the text of the NT, which then allows future pastors to convey that electricity to their people—or, to use my phrase, to “take them to the game.” And from the standpoint of the professor, everything that is done in the classroom must be directed to this end, whether that be the discussion of forms/morphology, the discussion of syntax, the discussion of the Greek verbal system, the discussion of vocabulary, or whatever. Such features are never ends in themselves, but they are always building blocks for creating a fuller understanding of God’s dynamic, saving Word. Let me conclude with several observations concerning, specifically, the teaching of elementary Greek. A good teacher has three qualities—qualities that are at a premium when teaching introductory courses such as elementary Greek. First, a good teacher must know his subject thoroughly. That is why it is important to stay up to date on a whole range of linguistic issues and to be a regular participant (not just attendee) at scholarly society meetings. Second, a good teacher must love people. If he does not have genuine affection for his students, he should be doing something else. And, third, that teacher must remember what it is like not to know, what it is like actually not to “get” what a chapter (or a section of a chapter) is about. Especially the last of these qualities is so critical. It gives empathy with the student. It gives insight into the source of a student’s struggling. And it, thus, enables the professor to build necessary interpersonal relationships and to communicate effectively—all foundations to a successful classroom experience. Such an experience is not merely a transfer of information, though such transfer does occur, but it entails having a common learning experience together. Peter Nafzger and David Schmitt discuss the craft of preaching topical sermons, with Ash Wednesday as the case study. I never was able to sit in one of your classes, but I remember the late Dr. Wayne Schmidt, who taught the entry level Greek classes to us second-career men so very long ago. He made us work hard to get it so that when he called on us, we could, with confidence, articulate an aorist, a middle voice, and so on. He would tell us that he didn’t care if we failed or if we didn’t get it, but we all knew he cared deeply for each and every one of us. I was his slowest student, but I could tell he had compassion on the weakest links. Many thanks for your article; it stirred up a memory for a great teacher of pastors. And you are correct. Empathy along with the other things make for a true teacher of Biblical languages. An inspiring exhortation to study Greek. It’s been almost 28 years since I graduated from seminary. I still read by Greek and benefit greatly from it. See you next time at SBL, Jim! Dr. Voelz’s analogy of a football game fails because the result of the game or a play in the game is the same regardless where one is at. It does not depend on the person at all. However, if one only uses a translation they may misunderstand Fundamental Articles of Faith. For instance, the Vulgate in some places translated “repent” as “do penance” without knowing the Greek in this example the sedes doctrinae is changed or blurred. Another example is the translation of the RSV of Isaiah 14:7 that says, “young women” instead of “virgin”. These would either change or cause doubt in Fundamental Articles do to relying on the English without the Greek or Hebrew. Then we have the problem in American when the Saxon first arrived with the lack of translation of the Book of Concord. The English language did not lend itself to correct teaching. Hence, the original languages are essential in properly understanding the text.